Fountain, Colo., Water Department Foreman Justin Moore was working to remove perfluorinated chemicals (PFCs) that were detected in the water supply in 2016. While it was not mandatory to remove the contaminants, the city decided it was best to filter out the PFCs for the benefit of residents’ health. The water department in Fountain serves approximately 27,000 customers, 80% of whom are residential. The water infrastructure is made up of approximately 682,000 ft of pipe comprised of water mains measuring 2 to 24 in. of PVC (80% of the system), ductile iron (15%) and asbestos cement pipe (5%). A granulated activated carbon (GAC) filtration system needed to be installed for one of the wells. One of the water mains would need to be detoured into the GAC filter and then rerouted back to the water main. The new piping would be restrained, however, and standard methods of restraint for this kind of project would be time-consuming and costly with pipe rodding reinforcement. The option of using mechanical joints would mean that specialty piping of different sizes would need to be installed, further driving up costs. “Normally, this kind of a project requires a sizable investment, both in terms of materials and labor costs. Given tight budgets, anything we can do to save the municipality money makes a difference,” Moore said. 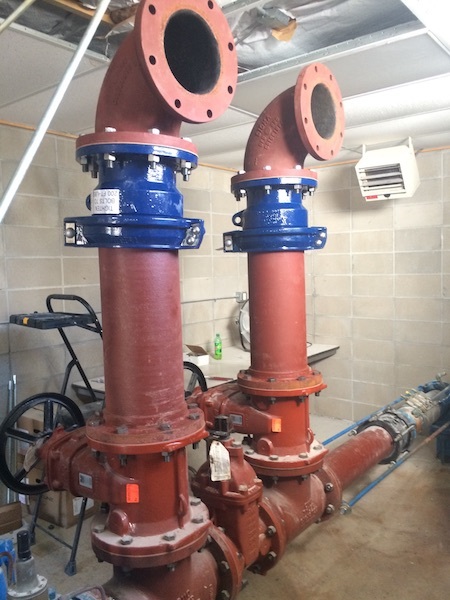 To install the GAC while minimizing costs due to speciality piping, restraint rodding and reducing worker time in the ditch, Moore decided to use a series of six Hymax Grip flange adaptors to restrain the pipes directing water through the GAC. These flange adaptors could be connected to straight-end pipes with the flange end connecting to another flanged pipe. No rodding would be required, nor specialty piping of different sizes. The flange adaptor provided several advantages for Moore. The special chain offered circular restraint around the pipe, unlike typical wedge-style restraints that point-load and weaken the pipe. As the pipe applies axial pressure, the chain increasingly tightens around the pipe to prevent pullout. The radial closing mechanism also holds the pipes tightly in place during installation to give installers full control over the gap between pipes. The Hymax Grip has a universal gripping system designed to restrain metal and plastic pipes and has a transition capability of up to 1.1 in. It can work with a wide range of pipe diameters, replacing Moore’s need to use a variety of size-specific sections, which would be necessary with mechanical joint couplings. The internal restraining design meant that there also was no need for rodding, an expensive and time-consuming installation. By using these flanges instead of mechanical joints and rodding, Moore could get the job done faster while employing only four workers, compared to six. Not only did Moore save the water department money, his workers spent less time in the ditch to minimize risk during the job. It is made of highly durable ductile iron, and can withstand working temperature of up to 125°F. It meets or exceeds AWWA C219, NSF 61 and NSF 372 standards. The coupling’s dynamic deflection reduced the risk of damage and cracking due to ground shifts and temperature changes. Its patented gasket transforms the pipe joint into a flexible connection and allows dynamic deflection of up to 4 degrees per side. The product can adapt to out-of-round pipe shape for optimum fit on both ends with its radial closing design and sealing system that can eliminate installation errors. Even if pipes are a bit out of alignment, the Hymax Grip’s dynamic deflection can still allow for the connection, meaning there is a smaller chance of mistakes during installation. These features make the coupling a long-term solution that reduces the need for future repairs and maintenance. The coupling’s nuts and bolts have advanced anti-galling that uses a dry treatment process with molecular anti-galling based on embedded zinc to prevent galling and enable repeated bolt tightening. It eliminates the need for grease, preventing dust and dirt buildup. The Hymax Grip’s fusion-bonded epoxy coating helps insulate against corrosion. Using these flange adaptors allowed Moore to restrain pipes easily and at lower cost. Instead of using mechanical joint couplings, size-specific sections of pipe and restraint rodding, Moore was able to use Hymax Grip flange adaptors, with their wide transition capability, to get the job done with fewer staff. Workers spent less time in the ditch to help minimize safety risks. The ductile iron couplings were durable and featured dynamic deflection to reduce the risk of damage and cracking due to ground shifts and temperature changes. “At the end of the day, we were able to install the filtration system faster and more easily, meaning residents could sooner enjoy the benefits of clean water,” Moore said. Stan Pachorek is a territory sales manager for Krausz USA. Pachorek can be reached at 352.789.9190.